With Valentine's Day around the corner, couples everywhere are gearing up to impress their partners. 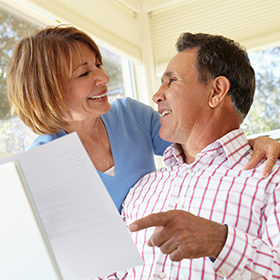 Buckling down on finances may not be the first things that comes to mind, but maximizing savings for retirement can be a joint effort for married couples who are ready for that phase in their life. Even if one of the spouses is not working, there is an option a lot of married couples are not taking advantage of and that is the spousal IRA contribution. Eligibility requirements for making a Traditional IRA contribution are that the individual must be under the age of 70 ½ in the year for which the contribution is being made. They must have earned income as well. The maximum contribution for an individual under the age of 50 is $5,500 and for someone age 50 and over the maximum is $6,500 for 2016 and 2017. Their level of earned income can reduce what they are eligible for. As an example, if the individual’s earned income is only $5,000, they may not make the full contribution limit for the year. This is where the spousal contribution rules help maximize the couple's opportunity. If the couple files a joint tax return and their combined level of income is enough, they will be eligible to make the full contribution limit for the year for each person. Another issue is deductibility. In some cases where there’s only one wage earner, the wage earner may be the only one eligible to participate in their employer’s retirement plan. By participating in the employer’s retirement plan, it may limit that individual’s opportunity to use their Traditional IRA contribution as a tax deduction. Their level of Modified Adjusted Gross Income (MAGI) depends on whether or not the employer plan participating spouse can use their contribution as a tax deduction. When making a spousal contribution, the level of compensation used to determine whether the non-participating spouse can use their contribution is much higher, therefore it could allow that spouse to not only contribute, but also use the contribution as a tax-deduction. In this scenario, one may not be able to use their contribution as a tax deduction and the other can. It is good to note that when making an IRA contribution (spousal or not), each individual must establish their own IRA separately. Now let’s look at Roth IRAs, and use the same scenario as the example above. Since the participating spouse may not be able to use their Traditional IRA as a tax deduction, they may want to consider making their contribution to a Roth IRA instead. Since Roth IRA contributions may not be used as a tax deduction already, this may be more advantageous since eventual distributions from the Roth IRA are tax-free. However, Roth IRA eligibility requirements impose a maximum income limit to determine their eligibility to contribution. One of the biggest benefits on the Roth IRA is that age is not a factor. As an example, a couple has one of the spouses still working and under the age of 70 ½, however, the other spouse is retired and is over the age of 70 ½. The spouse retired and over the age of 70 ½ may still make a Roth IRA contribution as long as the couple is married and files a joint tax return and their combined income does not exceed the limits to make a contribution to the Roth IRA. The Spousal IRA is a useful tool for married couples to increase contributions and retirement plan balances. Talk to an IRA specialist to learn more about spousal IRAs by clicking here.